Why not Make your last few nights of freedom one to remember with Poi Passion. 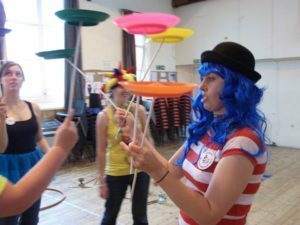 Try 7 different kinds of circus skills with Poi Passion qualified circus workshop instructor. This is a fantastic opportunity to indulge that inner child. Get lot of fun photo’s and experience a more diverse choice of Hen do! Done in a fun FRIENDLY safe environment. Rooms cost between £15 p/h up to £25 p/h. Kate Wright is First Aid trained and hold full Public Liability Insurance. Poi Passion Circus and Fine Arts organised a family circus skills workshop for us (six of us) just after Christmas. We had a wonderful time It was a fun and activity packed two-hour session. Kate was just amazing! She guided us through the activities with a plenty of encouragement and patience. Very friendly yet wonderfully professional. I have a feeling we will be booking Poi Passion for another session soon. Kate is an amazing performer, perfect entertainment for basically any event!